The latest in the Failte Series, released October, 2013. Compilation recording presented by the Celtic Music Centre in Judique, Cape Breton featuring some strong Cape Breton musicians of today, and the carriers of tomorrow. 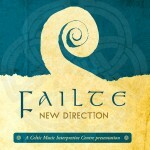 A mix of traditional and contemporary tracks showcasing the range of Cape Breton music styles. The download is a zip file containing all 13 tracks in high-quality 320kbps MP3 format. The latest in the Failte Series, released October, 2013. Compilation recording presented by the Celtic Music Centre in Judique, Cape Breton featu..